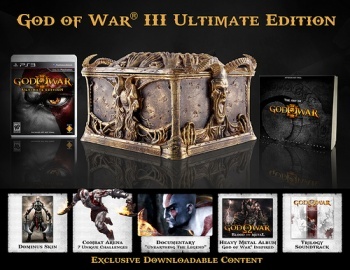 Don't have God of War III yet but want the snazzy Ultimate Edition? Why not buy one on eBay and support medical research at the same time? There's a ton of cool stuff in the God of War III Ultimate Edition: A full artbook, a gorgeous replica of the in-game Pandora's Box, some exclusive DLC - basically, it's got The Works (TM). Unfortunately, it's sold out pretty much everywhere, but that's what you get for not preordering, eh? However, if you want to try and get your hands on this awesome uber-limited edition and support a good cause at the same time, there's one up on eBay courtesy of PlayStation Lifestyle. Not only does this version of the Ultimate Edition come with all the standard bells and whistles, it also includes a nifty rarity: A poster signed by members of the development team, including big boss Stig Asmussen. The best part is that all the proceeds from this auction will go to Neurofibromatosis, Inc, a charity whose purpose is "to find a treatment and the cure for neurofibromatosis by promoting scientific research, creating awareness, and supporting those who are affected by NF." So, whoever wins this awesome special edition gets to know that not only do they have a one-of-a-kind God of War collectible, they're giving to a good cause as well. It's really a win-win situation here. At the moment, bidding sits at $152.51 with 9 bids, but there are six and a half days left to go - so who knows how high it'll get before the end? If you've got some cash burning a hole in your pocket and haven't picked up the stellar GoW3, though, you could do a hell of a lot worse.